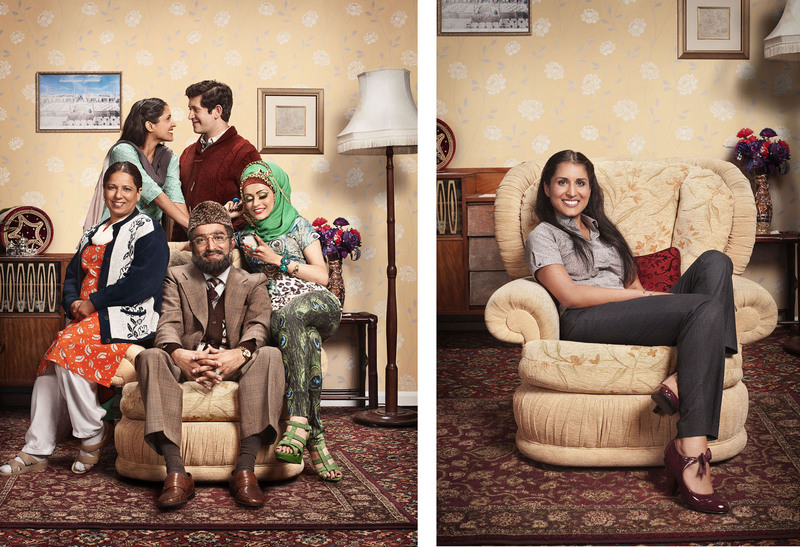 The new series of Citizen Khan kicks off tonight on BBC One and I am finally able to show you a couple of my favourite photographs created for the series. All the main set ups were shot by the lovely Jay Brooks in Manchester after the cast had finished doing one of the studio recording sessions with a live audience. We had decided to build our alternative ‘lounge’ set in the studio next door to give us more room to work than on the actual set used for the programme. This also gave us time to set up and test the lighting while the live episode was being recorded. As usual Jay’s lighting was exceptional. The finished shots inevitably needed a couple of ‘head swaps’ and other retouching work to get just the right combination of facial expressions, but little aside from that. This was managed by one of our great in-house designers, Alicia Kulikowski, who has since moved to Montreal (we still miss you Alicia!!! sob). I can’t remember what kit Jay used (sorry – maybe a later post!) but I know we were shooting straight to Capture One on his Mac laptop so the producer could review the images as they were being shot.